Shock, horror… the vuvuzela goes global! Johannesburg, South Africa (CNN) - The vuvuzela – the plastic South African trumpet whose loud rasp has become synonymous with the 2010 World Cup – has proved a phenomenal success with soccer fans attending the tournament. For many, this development has not been a good thing. While the troublesome trumpet does bring a new, authentically African vibe to the spectator experience , many complain it is at the expense of other enjoyable facets of the match-day atmosphere. The drone that collective vuvuzelas make is awesome. Johannesburg's Soccer City resembled a giant beehive when Bafana Bafana played there on June 11, and when the crowd coordinates to produce the sound in waves, the effect is like nothing heard in a football stadium before. However, it does drastically reduce singing among fans, which for an avid football follower is one of the highlights of attending a live game. The songs of teams from around the world – though often crude, rude and offensive – can often be humorous, touching and emotional. It is often remarkable how a collective of people can respond as one to an incident on the pitch through song. The vuvuzela reduces this reflex. There is also less room for other musical instruments to convey their sound. The samba drums of Brazil were very muted at Ellis Park this week, and that wasn’t just because North Korea put up such a good fight. However, for fans sitting in the comfort of their homes, watching the World Cup from afar, safe in the thought that the vuvuzela nuisance is only to be found in South Africa, there is a word of warning: beware, the trumpet is about to go global. World Cups often add new elements to the lexicon of the football fan. The 1986 edition in Mexico saw the “Mexican Wave” created, the World Cup in Argentina in 1978 gave soccer the unnecessary use of ticker tape and England’s hosting in 1966 saw the first mascot used. So could 2010’s legacy be an army of fans returning from South Africa to their home nations, vuvuzela in hand, with a serious intention to use them on the terrace of their local club? Would you bet against the drone of a vuvuzela being present at the first game of the English Premier League? The early signs seems to suggest this prediction may soon be a reality in England, after British retailer Sainsbury's revealed it had experienced a surge in demand for vuvuzelas. The supermarket group said this week it had sold around 50,000 vuvuzelas, and expected to sell out its stock of 70,000 within two days. Is this a bad thing for world football? Either way, the vuvuzela phenomenon shows no signs of stopping soon. The vuvuzela its a way foward. i just love its sound. and it makes u to wanna watch more of the game. They will no doubt be banned in domestic leagues, national fo0tball associations aren't as PC as FIFA. I believe we can acommodate the vuvuzela around the world as football started from England and spread around the world although the English are not good footballers it doesnt make the game bad. So the FA's should find ways tell let the vuvuzela work around the world with out causing any damage to the other supporters, lets adapt something from Africa as well as football is a world wide game now. Of course, whether it is adopted in other countries or not is another matter. We respect that it might interfere with the European culture of singing at games and for that reason might be banned in stadiums. In SA, singing at any sport has never been a tradition. So we'd appreciate if you can all respect our culture of making a horribly loud noise when we're watching in our own stadiums, built with our own tax money. Just because its the noisiest World Cup ever doesn't mean its the best. It reminds me of another football series in Japan where everyone had little whistles. I wonder how it makes the players feel. Will South African tax dollars or FIFA pay for widespread inner ear damage? LOVE the BUZZ!!! It's better than the WAVE. 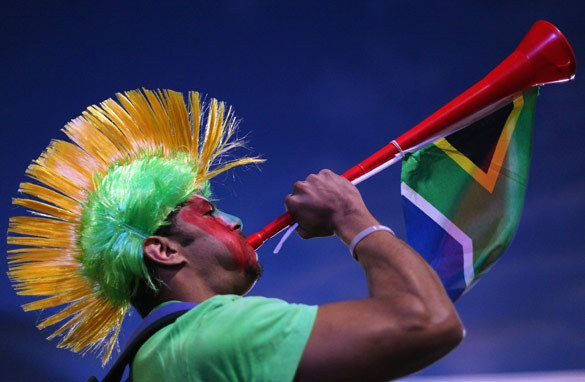 Hope the vuvuzelas will cease to exist outside the South African World Cup! As viewers at home, we cannot feel the emotion and excitement of the stadium fans anymore, all drowned out by the vuvuzelas. We used to chant and sing with them in front of our TV in the old World Cups, now all we hear is the unending bzzzz.... It's not that engaging and fun anymore. Please bring back the emotion. Unfortunately they are easy and cheap to produce, so every idiot with a desire to be obnoxious can buy one. With the next cup being hosted in yet another 3rd world country, I fear that we haven´t heard the last of this. Can we all agree on one thing...the constant noise is boring and irritating and has ruined this World Cup. Many people I work with are now not watching...pure noise pollution. Hopefully Brazil will show some style in 2014. The vuvuzela will end as souvenir – not in the stadiums of any premier league. In germany for instance a widely demanded "vuvuzela-ban" has to be decided by the clubs individually. And the first club (Borussia Dortmund) has already banned it from its stadium, others will follow soon. The german Bundesliga will most probably stay vuvuzela-free. As a Soueh AfricanIcan tell you that this vuvuzela craze has nothing to do with African culture -it isjust mindless noise and created by someone who wanted to make some money and boy is it working for him! It definately takes away the enjoyment of crowd participation in singing and jesting. For people watching at home, it is highly irritating and there is no fun in it. what about the health repercussions regarding possible hearing impairment? Really mindless noisemaking – is this the best SA can give the world? Stop complaining and enjoy the GAME!!! The vuvuzela is here to stay during the world cup, I would just prefer if they are blow before & after the match, at half time and when goals are scored while the players are celebrating, that would keep everyone happy. So just for the sport of it, let's bring in new noise makers that will be louder and more expensive to purchase. Just to enhance the competition. Among fans. There are high quality canned air horns which shriek at very high volumes that would work for this. So, each time a vulvuzela starts to blow, an even louder and more obnoxious air horn rally is started by folks wearing ear plugs. In response, perhaps the vulvuzela folks could start carrying small firearms and be a bit more "competitive". Because hey...this is all about football, and we KNOW how laid back most fans are about the sport. Let's get their blood pumping...onto the streets. This trumpet called now vuvuzela exists in Brazil for, like, years... We've been using those trumpets since 1994 cup (or even before) and every time we have a match – local ones – there are people selling or making noise with "vuvuzelas" – we never named it this way in here... Of course most of those things are imported from China nowadays and sold on the streets and shops for a lot of money (now that the world knows about them). LOVE IT OR HATE IT- is is here to stay!!! This 'annoyance ' is our beautiful way of rejoicing and giving support to ALL teams. It can be understood by young and old. It transcends all colors. No words/songs are needed, just your lungful of air will do. It simple says "We are behind you all the way!" So bring out your vuvuzelas World and join us!! Get a life, people! I was at the Portugal Vs. Ivory Coast game, and heard no one complain about the vuvuzelas. It created an amazing atmosphere! Oh! and FYI Marty – South Africa isn't a 3rd world country. It's a Developing country. Vuvuzelas are here to stay. vuvuzela? too noisy. South africa please, stop the noise and play the game. Find it extremely aggavating, irritating to the point that I have turned of the volume in the TV, or simply do not watch. I'm sure that the vuvuzela buzz is not new, a couple of years back horns were played with the same result at some televised European matches. It was impossible to keep watching with the racket being made but the cause was not discernable at the time. Anyways if the guy behind is blowing the horn annoyingly, simply wait till he has it in the air and drop a scoop of icecream down it's throat. Results guaranteed. I think they could regulate its usage like only blowing it when a goal is scored or at the beginning or end of a game. If people don't abide by this then they could look at banning them. That piece of plastic is not part of S.A football (soccer) culture and it hasn't been around for 20 years. In fact it has been around for less than 7 years. I agree that vuvuzela's should be confined to being blown until kick off, when goals are scored and at the end of a game. Not everyone likes them, so those who do, should respect those that don't. It must be said however, that the vuvuzela sounds different on TV than in the stadiums. On TV it's a constant drone. In the stadiums one can here the different pitches at which they are blown. Not every vuvuzela sounds the same. I love blasting away on my vuvuzela. My 3-year-old has also learnt to blow it. Every now and then I hear our neighbours blasting away with a reply. It would just required one sample of study fro´m this world cup to find out how many people might become deaf in the weeks after. Has anyone thought about how constant exposure to a noise of that magnitude actually is a healthrisk? the vuvuzelas damage hearing to people and players, it ruins the game experience to those that do not like them, it destroys the fans singing and cheering. How many people will take their kids to a soccer game to become deaf? It,s a stupid discussion. It,s only important play the game. And it's here to stay...If Americans think it's "awful" they should watch their American football or baseball. The vuvuzela is going nowhere. Those scientific devices are ridiculous and should be used to measure damage done by alcohol and cigarettes. Leave the vuvuzela alone!!! An instrument EXACTLY like this one has ben around Mexican Soccer Stadiums for DECADES. I'm 44 and I have seen and heard it for all my life. I hope this cheap plastic pipe needed to be banned not only as an utter nuisense, very irretating but also could be use as a wapon. We go to the ball park to hear the cheer & jeers. This vuvuzela is bad news to enjoy a game. I hope authorities in US sees it as a wapon and ban it from the games. No players likes it. these plastic vuvuzelas are not from africa...they are made in a toy factory in southern China! It´s a terrible thing, they should ban them from the rest of the WC! God hope they dont spread that pest outside South Africa. Vivaaaaaaaaaa Vuvuzela...Love it....People have to stop nagging. Long live the vuvuzela! May the vuvu global phenomenon continue to grow in leaps and bounds. The western media is just jealous because the Vuvuzela is of AFRICAN origin and has been made popular by AFRICAN fans in an AFRICAN world cup. It is high time that the VUVU critics embrace the VUVU. We do not need westerners' approval to blow the VUVU. Let's blow the VUVU even louder. I rather dismayed at the world for the amount of hate and anger towards our beloved VUVUZELA! Why is it that we need to conform to the normative behaviour of how Europeans like the game. Have you attended our rugby matched, have your seen our cricket? we dont sing crude, rude and offensive songs, that is often results in fist fights inside or outside the stadiums... The hooligans have showed us enough of how its done. We enjoy we loud and noisy instruments. The Vuvuzela is a simplified version of the KUDU HORN. Do some of you know what a kudu is? Please read up on african culture and traditions and become informed before dissing it. The kudu horn is blown to call upon the native ancestors and elders to aid for our call for help or support in a traditional ceremony. This has been adopted by soccer fans to call upon help for the team you are rooting for to win. It has somehow lost its meaning, but it remains a vital part of our culture! There seem to be reports also that it started in 2001 etc. The Kudu horn has been around way longer and so has the plastic one – the simplified one. The atmosphere, Rhythm and beat is certainly something worth feeling when the Vuvuzela is blown at the stadium. You cant really sit infront of a TV screen and winge, moan and complain if you not feeling the South African Vibe and Jive.... Its that different! We watched the last nights game of Mexico and we had Vuvu`s, wine and snacks, we felt it with them... So its really how you choose to enjoy the game. Then again theres also the mute button on the set, or an off button if all you gonna do is criticize, condemn and insult us. Shame on you all for trying to suppress of African way, similar to that of the colonialist, we are a new nation, with vibrant cultures united by Soccer and our Vuvuzela`s.. Even the world embraced it, why cant you! too noisy first time i heard i thought may be there is some problem in tv transmission. i wish tv broadcasters could filter it someway. How interesting it will be when future World Cup hosts each add their own noise maker to the spirit of sport. I can just imagine the variety that may come from Chile to China, Zimbabwe to New Zealand. maybe vuvuzelas made bafana bafana to lose that game against uruguay because of that noise which made a miscommunication amongst players. Sadly the vuvuzela is being abused by supporters who do not go to local matches and hence do not know the proper use of the vuvuzela. They just stand in the stadium blowing those things needlessly and without reason. If you at a local match with true SA supporters you will hear how it is meant to be used and the effect you get from it.. I was sympathetic to the Western concerns but over the last few days I have been racially and maliciously attacked just because I am a South African and due to the viscious attacks I actually encourage everyone I see, including foreigh supporters, to blow those things as hard as they can. It is dissappointing that there is still such an air of superiority and racism that seems so prevelant in the West towards Africa, and until that changes we will do what we do even if it is in spite, childish I know but the ball is in your court. We now have something new to use on Jan 1 @ 00:00. OK lets then do what other countires do, ban the vuvuzela, sing some songs and then go and riot in the street, burn cars, smash glass bottles, scream hatred, instigate violence. Leave our vuvuzelas alone and try and learn something of our culture before trying to force us to abide by your culture or traditions. This is OUR country, WE are the hosts, here we do things OUR way. Well done to South Africa, we are proud of you, of our boys in yellow and we going to keep on blowing our vuvuzelas – get used to it. The vuvzela is not new. I saw plastic trumpets on sale at US hockey games 30 years ago! nobody is suppressing the African Culture so don't go Dramatic all over it, the simple fact is that the vuvuzela's sound is nice if it was just a coupe of them in the stadium, else it's just NOISE and a loud one, the first time i heard it i thought we were attacked by Killer Bees !!!!. How much time does one spend watching the World Cup or "enduring" Vuvuzelas in their lives? Surely, must everything be "the way it should be"? Tolerance is a virtue. In any case 5 games later one hardly notices the buzz. I think the issue here is that it's "African". Had the Japanese blown it in 2002, we'd all have sung its praises and bought twice as many. Like them air polluting autos. I notice that when the world become Africa in this 2010 Wa Ka, the Africa doesn't want to be world. The way they are talking is the whole world must follow their culture and rules whether it is good or not. Feel sick Africa. I believe the vuvuzela adds something unique to the first african world cup. And as expected, it does bring some great debate with it. What I didn't expect is the arrogance of the so-called developed countries when it comes to forcing their point of view across on what they look down on as "3rd world countries". Btw Marty, it is called a Developing country. The british media has been going on about providing stab proof vests, screaming about how you are going to be murdered twice while still in the airport, etc. My advice? Get of your high horse, feel the spirit of africa and enjoy the world cup for what it is in 2010 – an african event! South Africa, and Africa, has a great rythm, amazing and friendly people and will accept you with open arms into our warm continent. take the opportunity to explore and discover, not to just criticize because you believe that you are somehow entitled to it! The vuvuzelas is the most stupid idea i´ve ever known to use as a form of cheering at the soccer games. I expect to hear the beautiful African rhythm and dance, or hear the other form or art of cheering from other countries like the drums or the cheering crowd. Vuvuzelas are for African feasts, not for World Soccer games!!! They sound like bees and very irritating!!!! I watched the games without sound, HOW FRUSTRATING!!!! Can anyone do something about that? i respect all your opinions...but this is the first world cup in AFRICA, this is how we do it in africa, its our turn to celebrate football, and this is how we do it...so stop complaining. when we go to the next world cup in brazil, we'll play their drums, if the world cup was in england, we'd chant with the fans, if it were elsewhere, we celebrate football the way they celebrate it...this is how we do it...if u dont like the sound, then join, blow one urself and u wont be annoyed by the others blowing around you. Could anything be more annoying? It's so dreadful that broadcasters around the planet are trying to minimize it. Being there must really be unpleasant. have been fun if it was than incessantly. not only the noise is annoying ... but it is also a cheat ! our TV reported and showed here how, with the empty stadiums after the match, the hellish noise remains as loud as when the stadiums are full of people at the beginning of the match ! The one and only explanation to such mistery ? for those that are defending the vuvuzelas noise. Does South Africa have the chance to hold World Cup again? Yes, the Vuvuzela is annoying. Yes its our problem now, FIFA wont take a stand. FIFA is not considering the consequences of irresponsible, intensional, blowing of the Vuvuzela directly into unsuspecting fans' ears or close to it. I am attending most games and fan fests.... I'm exposed to these ignorant people until the 11 July. FIFA refuses to act, they do not know what these fans are up to. I've seen young children 2 – 5 yrs being blown at, at close range... by irresponsible parents, who are oblivious of the potential damage, that could result. Yet, FIFA refuses to ban the Vuvuzela. If I developed a hearing problem as a result of all this, would I have a case to sue FIFA? Agree with you 100 %. This is Africa's way of supporting. That is why FIFA changes countries every 4 years to create a new atmosphere and experience different cultures, Embrace the vuvuzela as we africans embrace your singing and drums. It's easy to stop the noise. All it will take is for someone to throw one on the pitch. FIFA will then ban it. It's true that the vuvuzelas give a new kind of atmosphere to the game. But I guess they should remain in Africa, it's their own specific. Nothing compares to the fans singing or applauding or whistling or the joy for a goal that we're all used to. The supporters noise is part of the game, part of the show with vuvuzelas there's nothing left but a long buzzing. The african fans can bring the vuvuzelas to their teams matches anywhere but I don't think there is a good thing bringing the vuvuzelas to the european stadiums. I am a South African I attending the game last night between England and Algeria. I took along earplugs(I did not use them), but found that the "noise" was not bad at all. The vuvuzela is part of the football vibe in SA. Most of the crowd were visiting fans – it surprised me to see that that about 80% of them had vuvuzelas( in their team's colours) and were blowing like mad. What an easy way to silence/answer your opposing fans! The Vuvuzela is unique to this world cup. It might not allow you to experience the world cup like you experience your soccer normally, but it is the flavour of this soccer event. I dare you...pick one up and blow! Try something new for a change. The debate about vuvuzelas is pointless. At last we have some flavour in a tournament that is otherwise neutralised by FIFA control. Rather complain about us all having to drink diluted tasting second-grade American beer in the middle of an icy winter in South Africa...THAT ruins the game! There is enough control and there are enough rules in soccer and in this tournament and from the people who run it all. Give us all a break, enjoy the game for the sake that it sounds a bit different than it has for the past however many years, and if you don;t like the noise on TV, turn down the volume. The singing of drunk soccer fans in Europe is not exactly a pleasant sound bite either! Hearing damage is a lot of nonsense – stadiums are loud. 68.000 people singing also leads to ear damage! Seems lyk our masterpiece VuVu ain't going nowhere, unfortunately here to stay. Shame on u all who feel dat VuVu should b banned cos dat s absurdity; so watch out if u feel dat VuVu s an alien, he s most likely 2 invade ur peaceful and quite country with all dat he does best! Da sad thing s dat ur fellow country men and women if u ain't S An r so in love with VuVu and ll probably bring him back home so gud luck! The Vuvuzela may be unique but think about it. It presents a uniform sound which drowns all other cheer sounds. Therefore no team apparently gains cheer advantage over the other. If fan support, cheers and chants, provide some advantage for teams, the question is who gains the upper hand in fan support when it's all uniform vuvuzela noise? No one!! The point is, the vuvuzela seems to have provided a level playing field in terms of fan chants, and cheers compared to the unique noises that fans would have made in support of their teams. Maybe this may also have contributed to some of the upsets in this world cup. This is just by observation and not based on any scientific research anyway. its disappointing to learn that even in 2010, someone would believe their ways are the best, l believe this is not just about the vuvuzelas being noisy about them being an african way of enjoying soccer, which is primitive some. not everything should be about england or italy orspain, this is a world cup in africa lets enjoy it the way africans enjoy it. why stage it in africa when you dont want the african atmosphere. QUICK! Will someone please have a lightbulb moment and invent the next new horrible noisy fad for the whatever global sports event comes after the WC2010? I have enjoyed the vuvuzela sitting from my home watching the SouthAfrica, even just now sounding the virtual version when Brazil scored, but I realize its dangers to the people within earshot (severe damage to hearing) and for an event with thousand attending (possibly droning out emergency announcements thus creating very a dangerous situation). So I am ready for the next silly thing, and someone better come up with something fast so the vuvuzela will remain something typical of South Africa and of the WC2010 . I agree with henning erasmus – I went to a game, loved the atmosphere of the fans, mostly because of the vuvuzelas, it was the only part of the whole experience that was fun because fifa makes the whole area around the stadium feel sterilized (I have no interest in buying american beer at an african world cup)...This is a match in africa...I do not want to hear european chants...world cup germany was in 2006, get over it. Vuvuzelas sound different on tv, not as nice as being in the stadium. Most people who complain are people who watch the games on tv (for free) people in the stadiums for the most part love the vibe it creates. ...But the real reason you are not hearing your boring chants and songs is because European fans didn't buy tickets in big numbers. Now go drink your tea and take a nap. As boring as the ESPN experts are, I'm glad there is something to give teh WC some ambience. Switch between Cahnnel 34 and ESPN just for fun. These horns have been around sice I was a kid in Mexico 40 years, nothing new. I wont be suprised to find that all the people who are complaining have never heared the sound of a vuvuzela inside the stadium, they just hear it on tv, I suggest they attend just one match and hear how beautiful is the sound when you inside. iv attended 3 world cup matches already and it was amazing that most of the fans coming from other countries where all blowing vuvuzelas and enjoying it. so if you complain about a vuvuzela please just tell me that you been to the 2010 world cup stadium. I am so proud to be in South Africa, I have attended 4 games already and it has been unreal!! the vuvuzela's are an amazing part of the 2010 world cup!! And no my ears are NOT damaged, although I do have a blister on my lip:-) To all those complaining and critising in the UK, Aus and the rest of the 1st world I feel very sorry for you, to all the tourists here, thanks for ignoring the media and giving us a chance, hope to get to meet as many of you as possible! It creates a monotonous sound of a giant beehive and that's all. On TV is worst since it becomes a background. The cute "sounds" you hear on soccer in no longer there. Tsk... it's all noise. The human spectator aspect is now absent. Please turn off those dam vuvuzelas. I find them very tyring and as a result, only watch (on TV) about 10 minutes of any match if I watch any of the game at all. I also would not consider going to any of the games even though I live in SA. Football isn't football with that noise, it destroyes the feeling of the game. Don't know why haters for the vuvu don't respect the rights of football fans who wish to use it as well as the uniqueness of this years world cup. You either decide to put cotton or that technology in your ear to reduce the effect of the noise or u don't watch the matches at all.....allow fans to have fan, if you're not watching, others are. The vuvuzela was not used as widespread before as now during the world cup. You could hear them faintly before, but now it is a novelty for every second fan/ tourist to this world cup to take one into the stadium. It is a bit irritating because you don't pick up on the atmosphere of the crowd and supporters, I have been to two games so far and the one with Argentina/ Korea was worse than Brazil/ Ivory Coast. My personal opinion is that a rule must be made that it may only be blown when a goal is scored and when players enter / leave the field, someone gets sent off/ yellow carded etc, otherwise your vuvuzela will be confescated by the marshalls. To hear the noise the whole time is too much, but it is fine for this world cup, an interesting experience! Come guys the Vuvuzela does not drone out the atmosphere of the game it creates it, and very loundly so there is no missing it. We in SA have been blowing it for years now and there is no nationwide deafness as a result so think you will be fine. Buy one and give it a good blow! Vuvuzela going global...... Well India can be a preferred destination with the world cup and IPL matches. Look at the crowds! Fewer than one in a hundred are blowing these horns. The vuvuzela is a bullying noise denying expression to the majority of the fans and FIFA should have at least tried to persuade peole not to use them. FIFA seem to drop the ball at every opportunity, and what's more, they seem to turn away from anything that can reveal the truth about a football game! They refused to fairly address the France v Ireland issue after Henry's handball, ignoring the fact that millions of us saw the truth on TV seconds after the incident; they didn't ask South Africans to leave their horrible horns at home so the true sound (singing, roars, gasps, groans, applause and cheers) of the vast majority of the crowd could be heard; they didn't agree to the use of limited appeals using slow motion video replays to definitively settle disputed referee decisions by quickly showing officials the true details of disputed incidents. . So why do FIFA consistently turn their backs on decisions that can show us the truth most of us want?. Hopefully, there'll be a completely new and enlightened FIFA board by the time of the next World Cup. All the foreigners are what whe call in Afrikaans (one of SA's official languages) 'moun gatte' meaning grumpy people that complain and complain. You guys think you own the world!!! You have done nothing but criticize us, it is almost like you are jealous or something. Shame to the rest of the world...SA steal your lolly pop. Anyway....white South Africans don’t really watch soccer, we watch Rugby where Vuvuzela's aren’t used. The vuvu is a SA soccer tradition. However we (White South African's) learnt to love it and I must admit I didn’t see the point of it either until the day of the opening match BAFANA vs Mexico, every body was blowing a Vuvu (black and white) and I never felt so united. I heard the drowning noise of the vuvu's outside and it felt awesome!!! And it is not just South African's blowing the vuvu's it is everybody including the foreigners because once you start you can’t stop. You can’t criticize something that you haven’t tried yourself. South african's are easy going people, we know how to have fun... example... i never blew a vuvu before – until a week before the opening game and never watched soccer either until the opening game... WHY???? you ask, because i love my country and if that is what SA soccer fans does then i do the same!!! VIVA SOUTH AFRICAN!!!! I dont think the vuvuzelas are going anywhere. Just look at it as Africa's own way. Instead of getting worked up, get yourself one and you'll see why you blow it so loud. I am a Nigerian, I love Vuvuzela, and for those who dont like Vuvuzela, they should give it a try i am sure they gonna like it. and for those who dont like it, they should please learn to tolerate bcos tolerance unite the world. PEACE. To all the grumpy people around the world moaning and groaning...allow me to educate you. South Africa is a very diverse country with almost 50 million people of all races and cultural backgrounds. Did you know that we have 11 official languages? Songs and chants therefore don't work for us as not all fans understand the language of another. The vuvu is therefore the way we unite, it's our way of celebrating. The next time the SWC is held in Europe or wherever you can do things your way. This is our time to shine so accept that we do not do things the European way. While at the stadium you realise why it is such an important part of SA sporting culture(Football). It weirdly enough doesn't seem as loud as it does on TV. I'm just really sorry that the vuvi haters aren't here to experience the wonder that is World Cup South Africa! We've been at three of the Cape Town games, took ear plugs with but never used them. The sound of vuvuzelas could be quite overwelming should people blow them from right behind you (especially if they are England supporters who blow non-stop:-) but this has not happened to us or any of our friends – overall we're having a fantastic time in South Africa. So, let me get this straight: people want the World Cup host nation to give up what's probably its most cherished non-violent football tradition? Good luck with that. Pick your battles, folks! P.S. Vuvuzelas have been at hockey games here in Canada for as long as I can remember. P.P.S. A cheap pair of foam earplugs will reduce decibel levels without affecting how well you can hear, so if you're lucky enough to be at the WC and are worried about your auditory health, there are easy solutions. I use those little things at concerts all the time. Just looked at the crowds again. Even, in the South Africa v France match, where South Africa played wonderfully, it only looked like fewer than 1 in 200 South Africa fans were blowing vuvuzelas. They were, however, moving their mouths apparently shouting and cheering. I would like to hear the noise that vast majority of fans were making (cheers, gasps, roars, etc. ), not the noise of the minority of fans blowing their horns and overpowering the sound of the majority. Even when South Africa scored their excellent first goal, I couldn't hear any crowd response – the noise was exactly the same as when nothing at all was going on in the game – just buzzzzzzzzzzzz. stadiums, cities, and countries can ban the vuvuzela. it's not an issue. It is pretty wrong to proudly brocast on CNN that Ghana is the first African team to advance in the world cup. Please make a your research very well and go back to USA 1994. Thank you and stop bringing Africans down by all means with your journalism. FYI Marty, if u have a problem with the world cup being held in 3rd world countries, maybe u shld quit watching football at all. Hate it or luv the vuvuzela is here to stay..!!!! the vuvuzela represents an African way of cheering on your team, celebrating a goal, or just simply having fun...if your lungs are strong enough! So, seeing as the World Cup is in Africa..,blow them, and blow them hard (no pun intended)! Vuvuzela.... A noisy World Cup. ban this stuff of polluting plastic from the face of the earth. You idiots. The straight horn is over 3000 years old (copper or brass) and the PLASTIC zuzu is American (not a good thing). I still have my 1964 Duke Blue Devil blue plastic horn (banned from the stadium). Do your d@^# research before announcing a cultural phenominon. We have delivered the best world cup till this far....Europeans were crying lungs out about crime, HIV and stadiums that are not going to be completed ontime....since we have proved them wrong, they have found another pet to complain about......Vuvuzelas. We might be regarded as a 3rd world country but we do not waste our time by moaning, groaning and hurling racial insults. So, to all little minded whitties....days of colonialism are over.....we will continue to blow Vuvuzelas while you sing during soccer mtches. Thnx to all South Africans, white and black, for defending our identity....South Africa rocks! !....I hope these crumpy people will live longer to witness "another 3rd world country hosting a successful WC. For now they must enjoy their miserable lives....Vuvuzelas are here to stay people....deal with it!!! Vuvuzelas (or clones thereof) are already being heard all over Brazil. Another example of a World Cup element being adopted globally was the chant of the Dutch fans in 1974. Fans of a team from my home town (Porto Alegre, Brazil) soon created their own version of the chant, substituting "Grêmio" for "Holland". But it sounded so mournful within the context of Brazilian games that fans of the rival team Internacional immediately began to mock it. The Vuvuzela is for the tribal mentality. There is no way any civilized person could listen to this useless instrument through a whole game. South Africa is and will always be a 3rd world cesspool. I hope you enjoy living there. So get used to it . I hope South Africa never get to host the world cup again. They destroyed the game as I know it, and hopefully it will recover next time around. Players could not hear each other and the ref has difficulty communicating with this horrible buzzing sound that never stops. Where is the singing, where is the spirit, all destroyed from those terrible bees. I hope the vuvuzela dies a horrible death along with the memories of this awful world cup we all looked forward to! What a waste! BETTER EMBRACE THE VUVUZELA NOW . IT WILL UNITE THE WORLD AND ERADICATE RACISM AND CHEATING IN SOCCER. I AM A MUSICIAN AND I LOVE THE SOUND .I WILL PLAY IT AT MY NEXT GIG.LONG LIVE VUVUZELA ! I attended three World Cup games in the last ten days. Once you've experience the buzz of the vuvuzela live you'll understand why it is here to stay. I am so sick of these armchair 'fans' moaning about South Africa and the vuvuzela. At every game I was surrounded by foreigners blowing their vuvuzelas (and loving it!!). I'll take the vuvuzela buzz over crude and offensive football songs any day. Judging by the number of vuvuzelas carried off my flight by foreign passengers this morning, so would they! There are some very ignorant and small minded people on this site and most of them are from the US who think once it is not the US it is horrible annoying and this and that. Some of your southern accents are more annoying that the Vuvuzela's. grow up the world consists of many things, people and culture and if you don't like it turn your Tv off. Always spouting nonsense with no thinking ability. Wish i could name all the names. What were the negative people saying about the vuvuzela again, considering that we as South Africans hosted a very, very successful world cup. Waht was that idiot saying about third world countries? This "third world country" showed the world that it is possible in third world countires. it is not all doom and gloom. Viva vuvuzela, viava the "gees". I really do not know why people make so much noise about the vuvuzeela. Every country has a unique way of enjoying football matches, The Mexican gave us the Mexican Waves, The German would rather drink their beloved Lager, well the British will sing 'Here We go ! Here We go!! Here we go or that dreadful music, Football Is Coming home, for 90 minutes and also Fight among themselves outside the Football Ground in the name of football. Where i think you lot get confused, the Vuvuzela isn't made for TV, you need to actually get off your @rses and watch the game in the stadium to appreciate the Vuvuzela and it's place in South African Soccer. Concentrating on blowing the Vuvuzela and simultaneously reading and enjoying the game requires long practice and tons of stamina. Vuvuzelas may have worked well in South Africa. Audiences overseas may have fallen in love with the vuvuzelas but they will need time, patience and perseverance to muster the art and become ardent blowers, admirers and desciples of the Vuvuzela movement. Spain and Netherlands did complain about the vuvuzela-but in the end they were the ones enjoying the sound most.thank you South Africa.forget about all that negative propaganda-THAT'S HOW CHANGE STARTS.